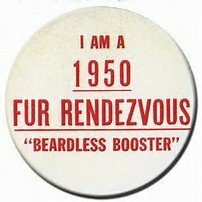 I was about 5 years old when I experienced my first Fur Rondy. Dad was working, so mom took me, my younger sister Anna and brother Tom to downtown Anchorage to have some Winter Carnival fun. 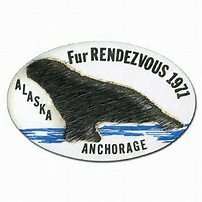 As we walked along 4th Avenue looking at all the sites, some men dressed up like Keystone Cops came up to my mom and asked "where is your Fur Rendezvous button?" Well, my mom told them she didn't have one, so the Keystone Cops went into a silly bit and said, "You're under arrest and you've got to go to jail." Our mom was going to jail? Me, my sister and brother got upset. Mom looked at us and said "it's alright, it's all for fun." Then the Keystone Cops took her across 4Th Avenue and put her into a "jail" they had set up right in the street. There was mom for all the world to see, looking at us through bars and smiling like she'd won a prize. Moments later, she agreed to purchase that Year's Rondy Button. Over the years, mom collected lots and lots of Rondy buttons that she proudly displayed in our home..
Years later I had the fun experience of marching in the Fur Rondy parade in the East High band. 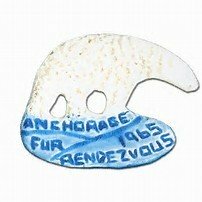 While my family and I no longer live in Alaska, I have been delighted to see that the Fur Rondy has grown to become known around the globe and is listed as either the best, or one of the best Winter Carnivals in the world. 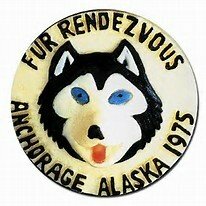 I still remember the days when Alaska Dog Sled Racing favorite George Attla, "the Huslia Hustler" faced Dr, Roland Lombard of Wayland, Massachusetts for years during the Rondy Dog Sled Races. All of Anchorage and vicinity were either listening to the race coverage on the radio, or watching the coverage on KENI-TV channel 2 (now KTUU) as we all cheered for George Attla to beat that guy from the lower 48. And by the way, if you haven't seen it, the is a movie about George Attla, "Spirit of the Wind" released in 1979. I saw the movie years ago at a film festival and it's worth seeing. The movie has had distribution problems over the years, but you can see a clip from the movie right here on Anchorage Memories.